We have our largest ever number of postgraduates in the Geography Department this year – 42 at latest count – and last Monday I welcomed them with a brief resume about the traditions of the Department. The photo above shows four Geographers that personify the four traditions. They are celebrating Prof. Vernon Forbes’ honorary D.Litt at the 1989 Rhodes Graduation garden party. 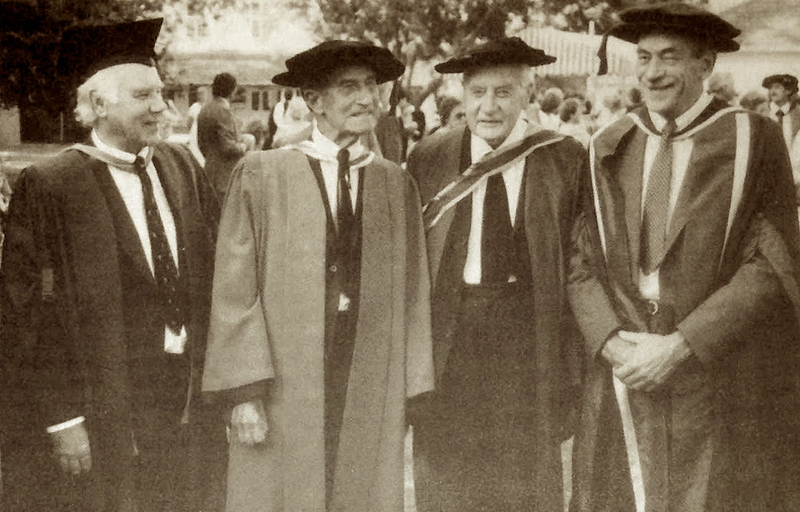 From left to right: Prof. John Daniel, Prof. Vernon Forbes, Prof. John Rennie (all formerly HoDs at Rhodes University) and Professor Ron Davies (formerly HoD University of Cape Town) who received the first Rhodes Geography M.Sc. in 1955. 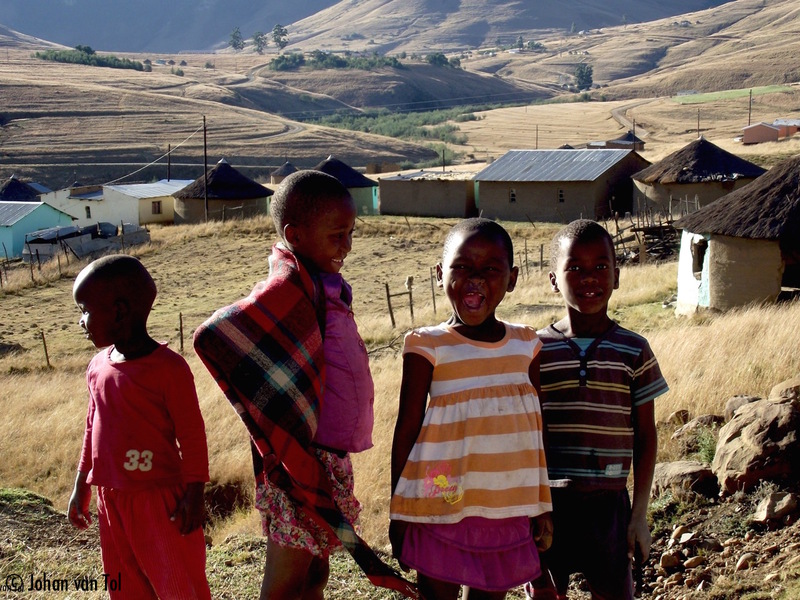 I’ve been researching our traditions since the Society of South African Geographers approached me to prepare a history of the Department for the commemorative publication celebrating 100 years of geography in the country. 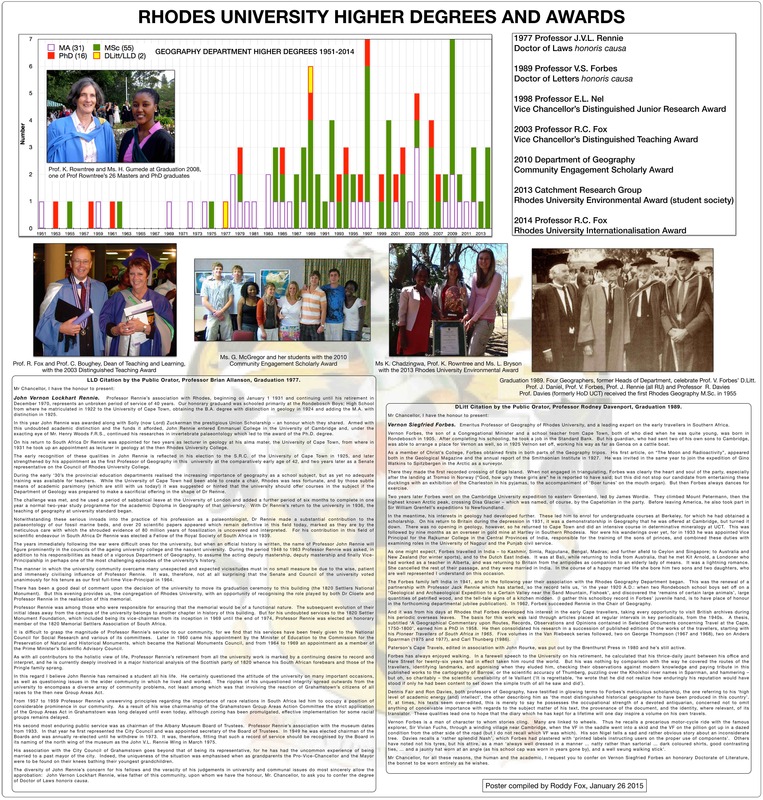 So I have been going back through the archives, studying the curriculum as it evolved, seeking trends in staffing demographics, examining the subjects that our postgraduates have studied, tracking contributions to, and awards for, research, teaching, community engagement, internationalisation and the environment. 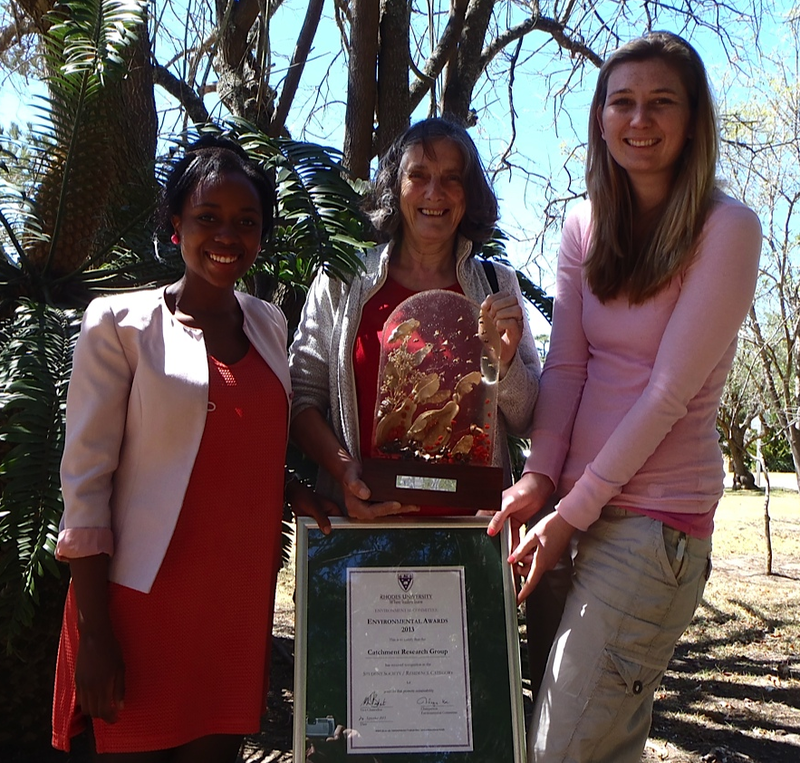 For example, here are Ms. Karabo Chadzingwa, Prof. Kate Rowntree and Ms. Louise Bryson with the 2013 Rhodes University Environmental Award. This is the first tradition and one which started with the Department’s first Professor, JVL Rennie. He was a fine scholar (Fellow of the Royal Society of South Africa in 1939) and he was awarded an honorary doctorate in laws (LLD) in 1977 for his much broader contributions to the University at large and community in general. He was Rhodes’ first Vice-Principal, Chairman of the Albany Museum Board of Trustees, Commissioner on the National Monuments Council, Mayor of Grahamstown, Vice-Chairman of the 1820 Settler Monument Foundation and Chairman of the Grahamstown Group Areas Action Committee. It’s in this tradition that the staff and students of the Department still serve. Recent examples would be the activities of the Catchment Research Group who won the RU Environmental Award in 2013, the Geographic Information Systems class who, with Ms. McGregor, won the Community Engagement Student Award in 2010 (pictured below). The Department’s staff have demonstrated the unusual ability to embrace widely different themes and approaches in their work. Professor Vernon Forbes was the Department’s second Professor. Trained as a geologist he was a flamboyant figure who was renowned as an arctic explorer. His undergraduate career at Cambridge was barely over when his first paper ‘The Moon and Radioactivity’ was published in both the Geological Magazine and the annual report of the Smithsonian Institute. Yet he was to be awarded a honorary doctorate in letters (DLitt) in 1989 for his historical geography: the series of books he wrote that chronicled the exploration of South Africa through the eyes of the Pioneer Travellers. His DLitt is the reason for the celebration at the garden party. Graduates and staff of the Department have examined themes of great social and environmental importance long before they became fashionable. Professor Ron Davies was a geography, chemistry major who went on to publish the classic urban geography text that outlined the workings of the Group Areas Act ‘The Spatial Formation of the South African City.’ Professor Keith Beavon was another science major. His career began as a lecturer at the Rhodes Port Elizabeth branch and later he became an internationally famous urban geographer. His paper ‘Black townships: terra incognito for urban geographers’ was an iconic call to become engaged with research into the problems experienced in apartheid’s black townships. The four Professors introduced above were recognised for producing research work of the very highest quality. That’s a tradition that has been proudly carried forwards to this day. Professor Etienne Nel, for example, won the Vice Chancellor’s Distinguished Junior Research Award in 1998. Four of our postgraduates have been awarded the SSAG’s bronze medal for the outstanding masters thesis: Ms. Maura Andrew (1992), Professor Vincent Kakembo (1998), Ms. Brigitte Melley (2012) and Ms. Christel Hansen (2014). 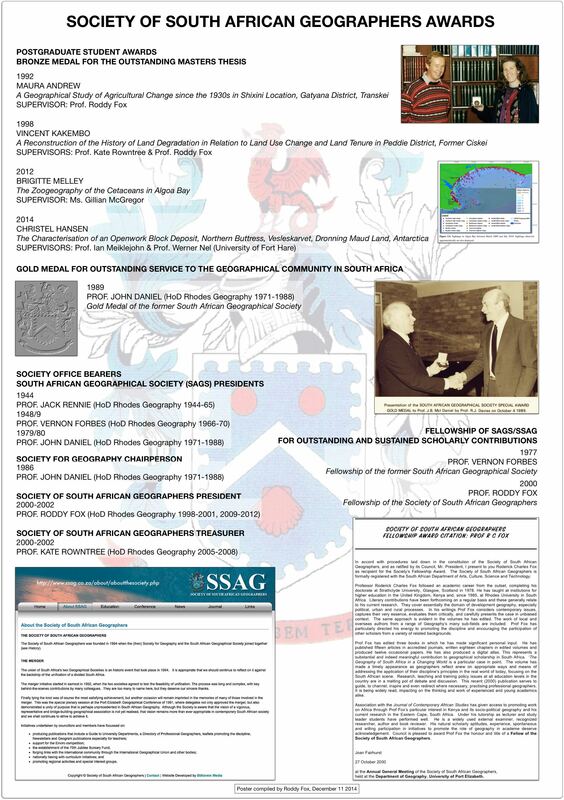 Professor Vernon Forbes (1977) and Professor Roddy Fox (2000) were given Fellowships of the South African Geographical Society and Society of South African Geographers respectively. These are awarded for outstanding and sustained scholarly contributions. 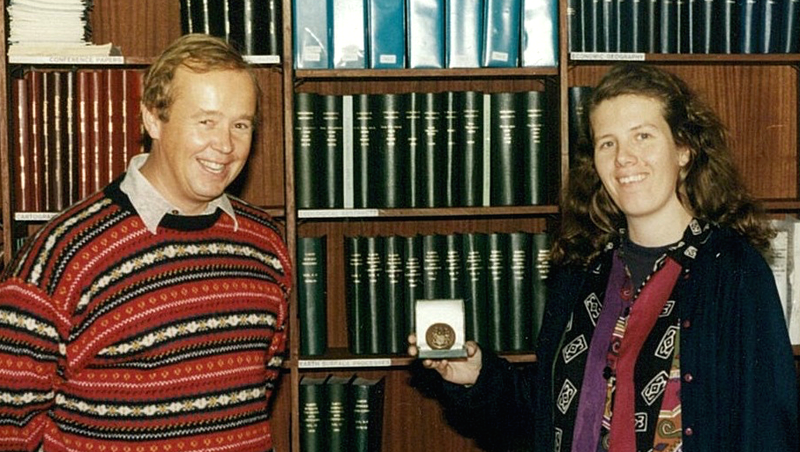 The picture below shows Ms. Andrew and her supervisor with the SSAG Bronze Medal for 1992. Our work as staff and postgraduates is replete with this. Special mention needs to be made of Professor Daniel in this respect. 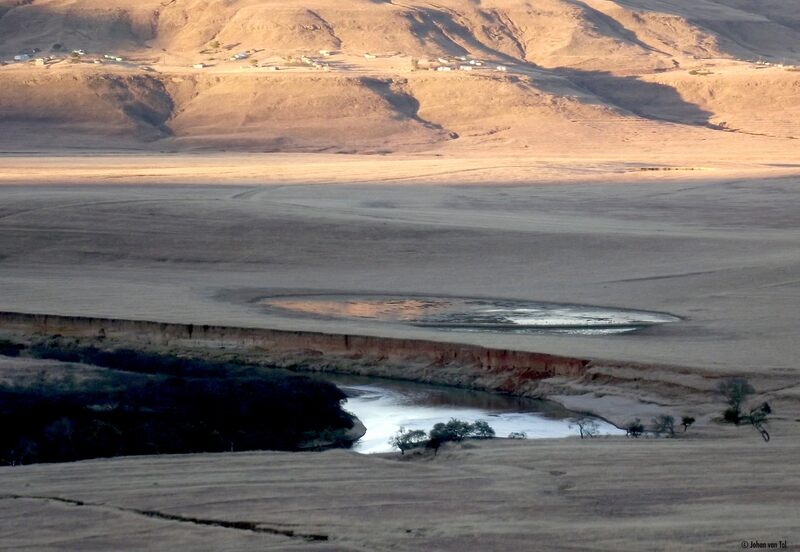 He was the Department’s third Professor but first Human Geographer and, displaying the intellectual agility mentioned above, quickly recognised the need for research into the water problems of the semi-arid Eastern Cape. Consequently he built up the Hydrological Research Unit through the 1980s: finding the funding for numerous staff posts, laboratories, new buildings and equipment. The HRU has since become part of the Institute for Water Research. Our curriculum today boasts a popular degree in Environmental Water Management that would not have arisen without his foresight. 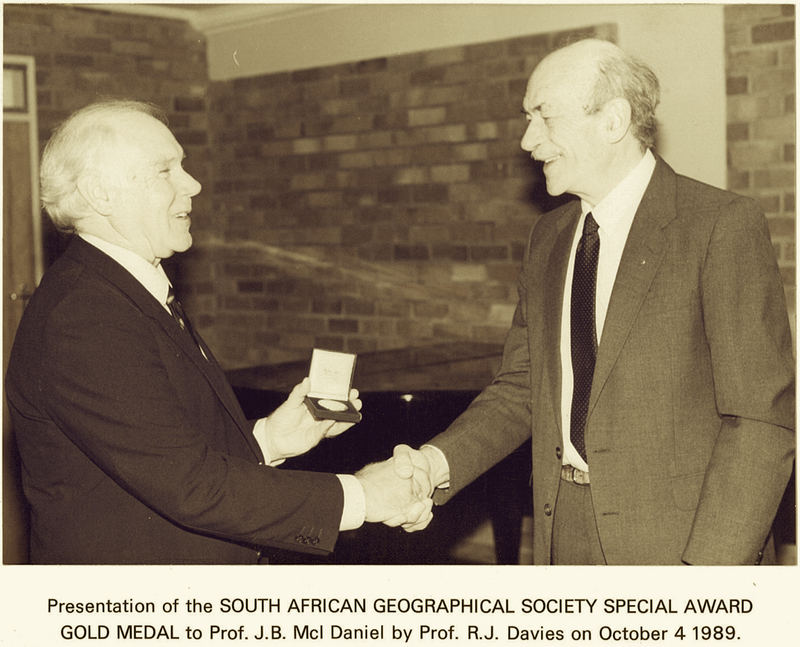 In 1989 he was awarded the Gold Medal of the South African Geographical Society for Outstanding Service to the Geographical Community in South Africa. All of the information highlighted above and much more is summarised in the two graphics below. These posters are on display in the foyer of the Department with examples of the awards. medals etc. It’s a sobering thought that the number of academic staff today (five) is the same as it was in the mid 1960s when Keith Beavon was in the Department. Clearly we will face major challenges in the years ahead if we are to maintain these traditions. 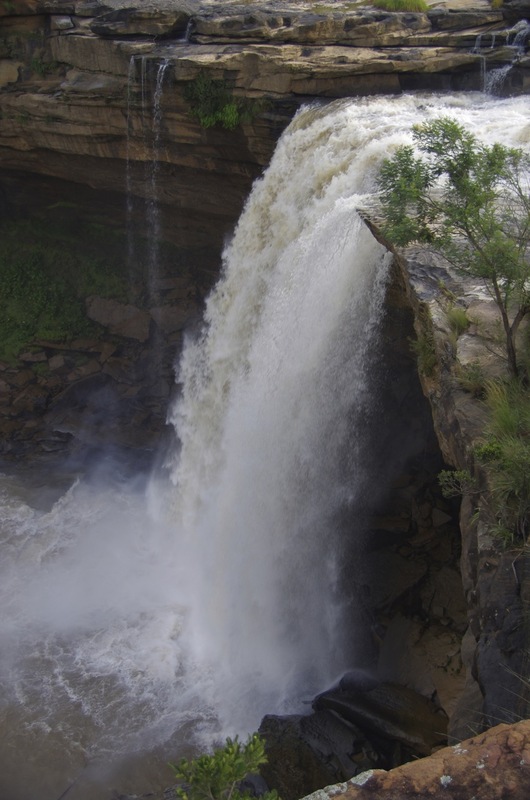 Grahamstown’s well-known as ‘the city of Saints’. It’s a bit of a cliche and so are many of the photos of our city. Picture postcard shots of the imposing cathedral and Victorian shop facades in Church Square spring to mind. I thought I’d try and get something a little different that gave a bit more of the feel of the place and the different buildings. So here’s three black and white shots. I like the Cathedral picture because it captures the scale of the building in its urban setting: the tree, wooden verandah and city hall make a frame for it. The Dutch Reformed Church is another building I walk past regularly. 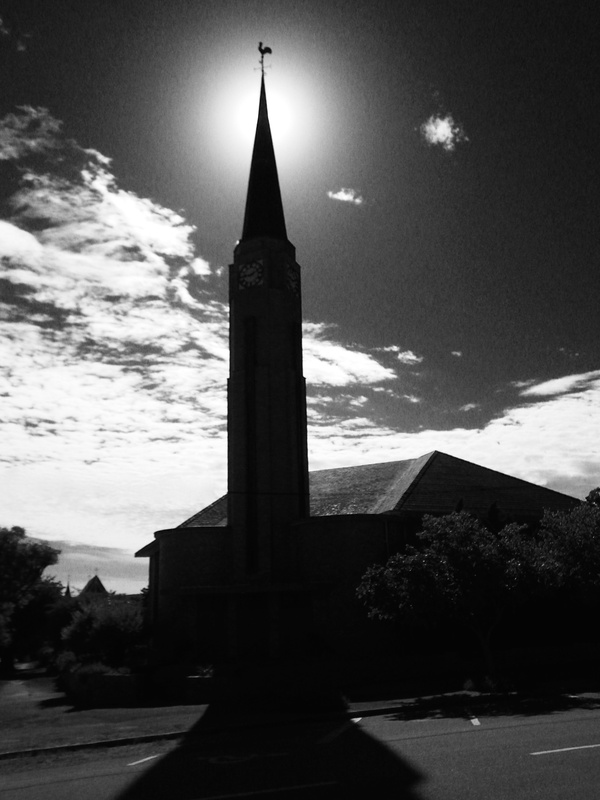 The shadow in the foreground leads you up to the steeple and the sky above. 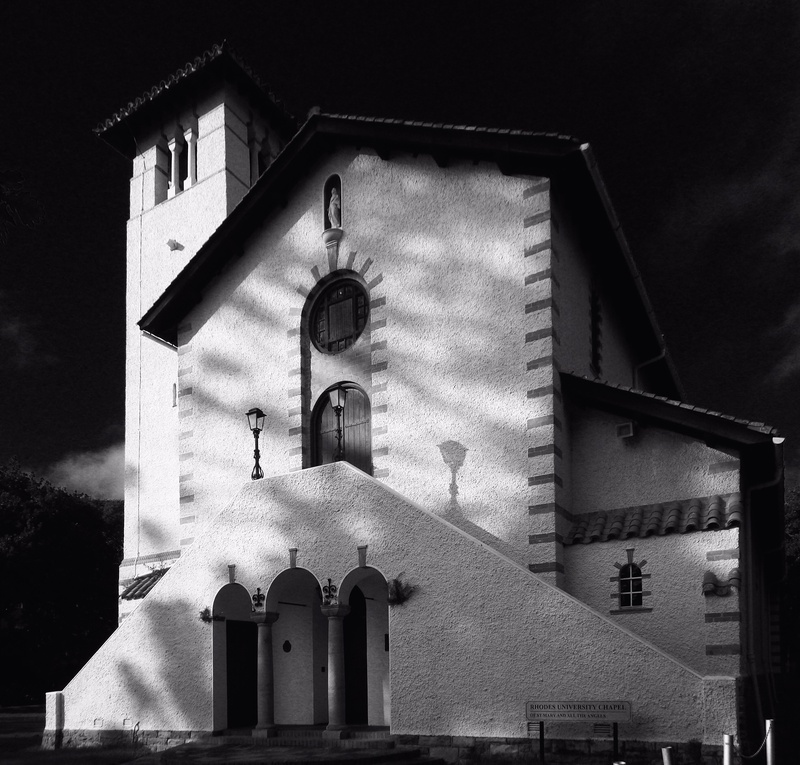 Lastly, there’s the Chapel of St. Mary’s on the Rhodes campus: it’s the rich texture that makes this picture, the slanting light and the dark sky behind. 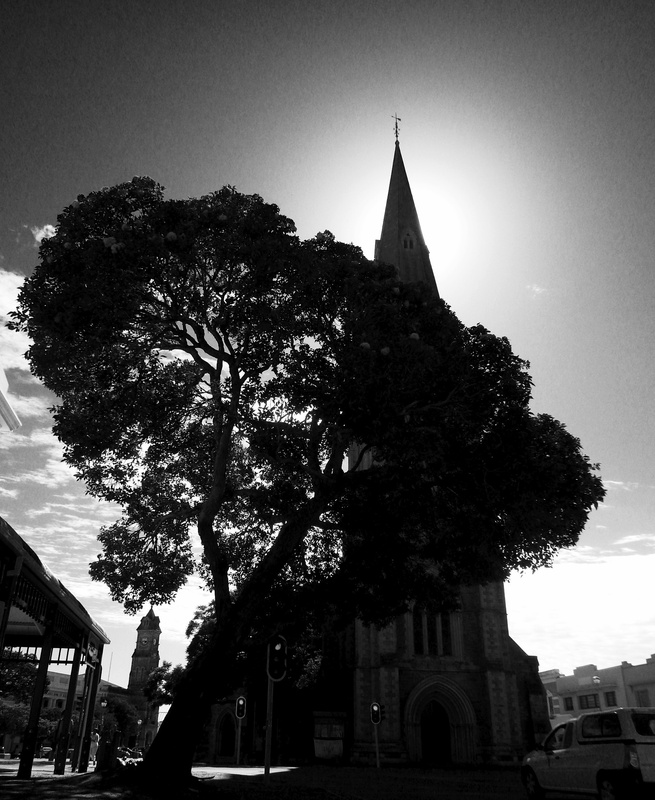 There’s a nice selection of my Grahamstown pictures over at my online portal roddythefox.co.za. We’re just starting work as one of two teams in the Water Research Commission’s Green Village Project. 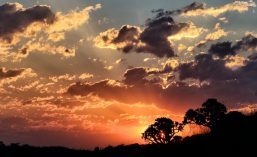 Ours is a team from the Geography Department’s staff and students led by Kate Rowntree collaborating with colleagues from the University of Fort Hare’s Agriculture Faculty. 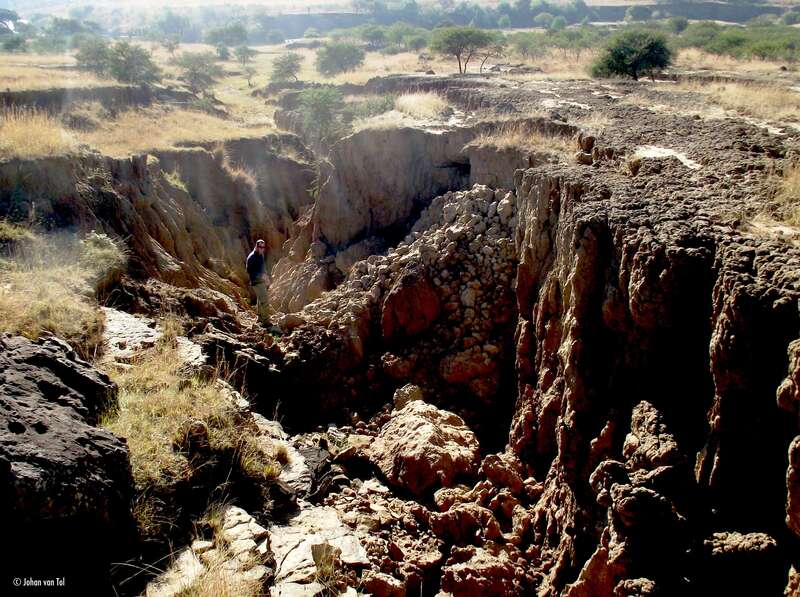 There will be approximately twelve of us working with rural communities to try and find solutions to the erosion problems in the area above the proposed Ntabelanga Dam. 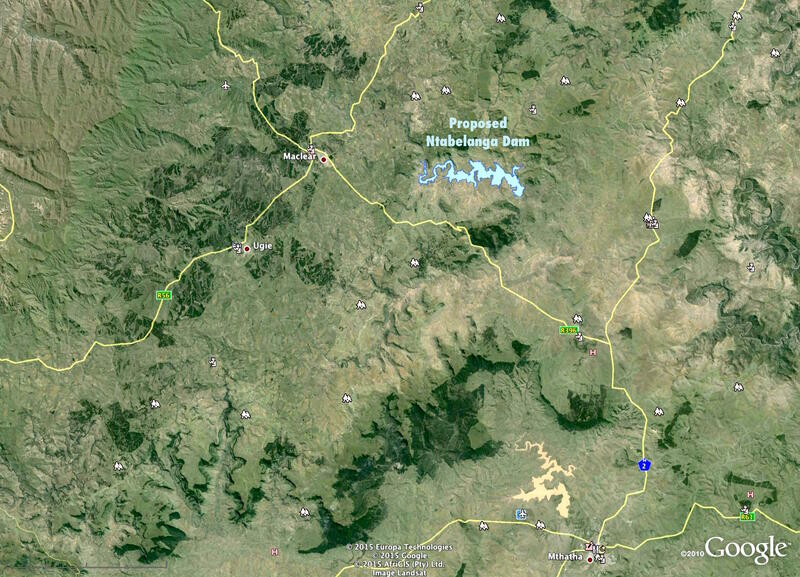 The dam’s going to be built in the upper reaches of the Umzimvubu River – to those of you who know the Eastern Cape it’s the deep river valley that you cross on the N2 just north of Mthatha on your way to Durban. 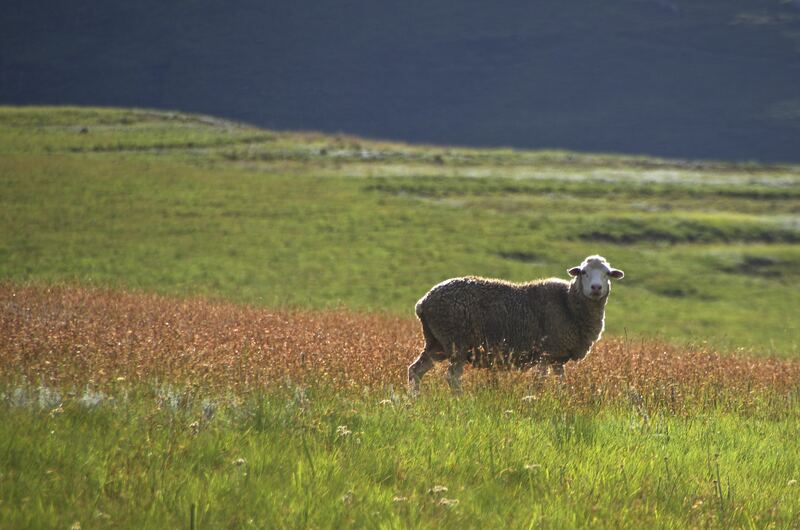 It’s a beautiful area as well as one with many development problems. 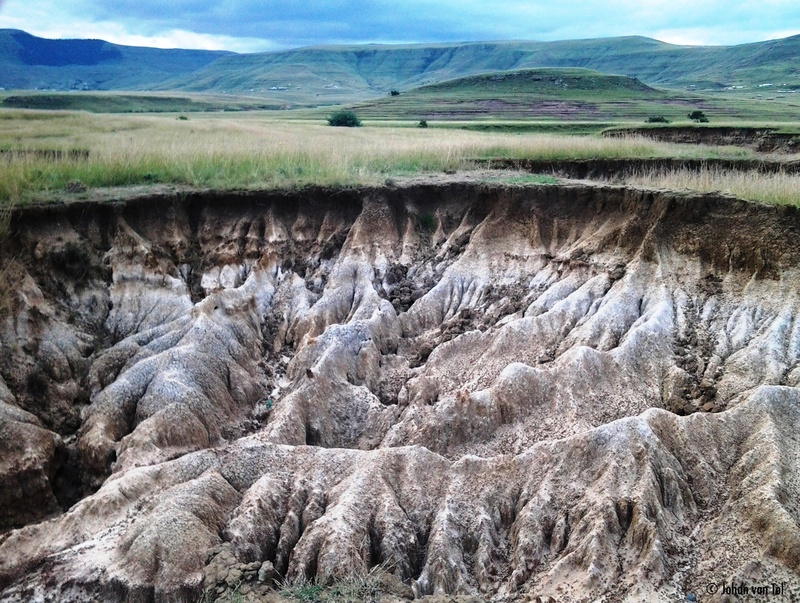 We’ll be busy trying to see if we can find sustainable village-based practices to prevent sediments eroding into (and filling) the dam. The pictures here give you a good idea of what the area’s like. 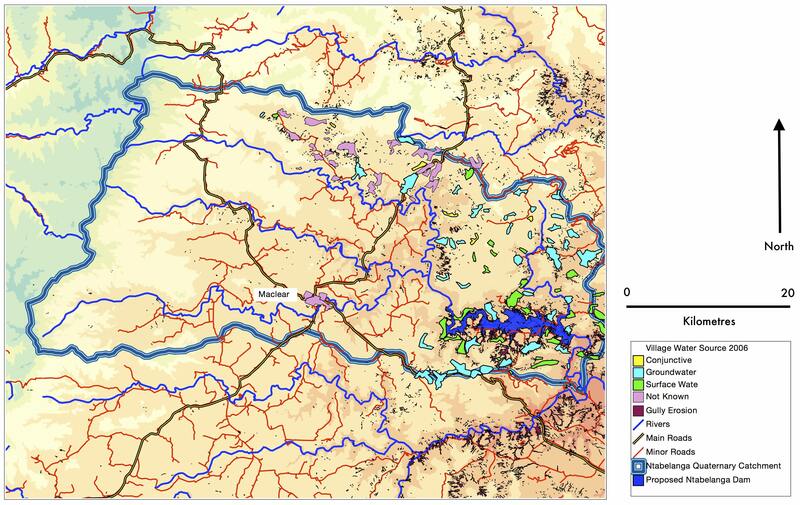 I’ve already been busy working on some maps of the catchment we are working in. That’s to help us find which villages to work with. Here are a couple of them. We’ll be working mostly in the area north and east of Maclear. They gave me a great big glass award at the end of last year for internationalisation. I won’t bore you with what internationalisation is: you can read about it in the University website. The award is quite something to behold though – an engraved glass world atop a glass column – and before it gets into a display cabinet I thought it would be fun to see if I could get an arty photo of it. The glass globe on the top would give a neat reverse image if you looked through it and the column could be used to mirror the Rhodes University clock tower. So I took a quick picture in the office and then went down into Quad 1 (by the fountain) for a first try of capturing the clock tower upside down. Then it was out to the front steps and a last couple of pictures looking up to the tower. Here’s a little gallery of the results. I like the last one best.